Following the successful conclusion of the early summer woodcut class, I decided to get going on the late summer edition. So yesterday I stopped by the office, picked up the check for the previous one, and reserved dates for the next one. I was asked to update the photo I had accompanying the write up last time. Nothing wrong with that photo (showing me working on my 21st Century Employee print), but I was advised that this would let those within the organization know the print class was a going concern, not to be removed from the website. 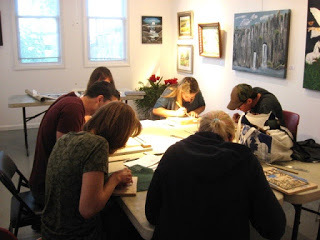 Between my role as the blogger for BelmarArts and my custom of documenting all my art activities, I had dozens, maybe hundreds of relevant photos that relate to the workshop, so not a problem. Except the e-mail system was refusing to send my mail with the attached photos to the office. and a few individual prints done in class over the years, and told her to choose what she liked. Or if she didn't like them, I could come up with more options. I guess she liked them, as when I went on earlier tonight all four photos were there, along with the new late summer dates. Once again we will be on alternate Tuesday evenings, now in July and August. (too many other things going on there to ever get the same day of the week in four consecutive weeks) The registration form is there as well, so people can start signing up right now if they want to. Could work out- for the most recent class the stuff went up on the computer only about 2 weeks before the class was to begin, and it was only promoted one week before it started, and I still had 3 paid students. Now I have almost 2 months. The down side is that they won't send out press releases or e-mail blasts until we are much closer, but are counting on instructors and participants to put it out on social media sooner. Thus this blog post. The next round will be on Tuesday evening, 6:30 to 9:00, on July 17, 31, and August 14, 28. For more information, go to the education section on the BelmarArts website, or just drop by the office whenever they are open. 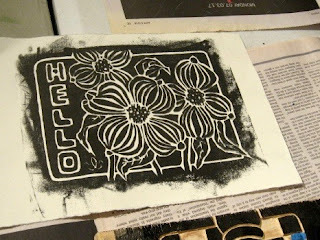 Well, all good things must come to an end, and that thing tonight was the current woodcut class at BelmarArts. I had three students sign up and pay, but only two have ever come to class, but both are dedicated. I was a little worried tonight because I heard they were having door issues at the Boatworks, but I heard nothing new and everything worked when I got there tonight, so I guess they resolved it all over the weekend. Tonight was the 4th and last night, which usually means a lot of printing. I've never had a class where everyone didn't finish and proof at least one print (some completing more than one), and I didn't want to break that streak. Last week we pulled a first proof on Linda's first block, an image of her black cat, and she had told me she planned to make a few adjustments to it before this week. She had also asked about hand coloring prints and mentioned a desire to hand print greeting cards, so in addition to the usual print supplies and tools, I brought in several examples of my past holiday cards and the catalog from the Painted Prints show I saw with Tom Huck on my visit to St Louis a decade or so ago. 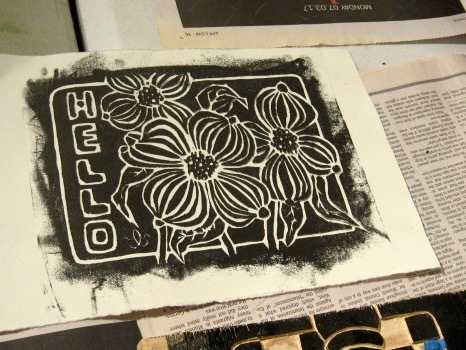 Meanwhile, Mary Ellen had acquired a few linoleum tools and found them more effective than those cheap woodcut tools she had been using, made some good progress on her block, even pulling a couple of proofs along the way. 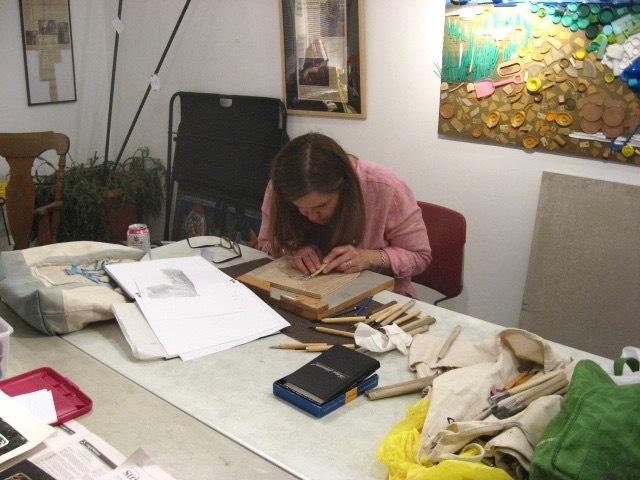 While Linda continued to look at my catalog, I put out my woodcut tools, Mary Ellen asked me to advise her on a few things with her block, and she grabbed a few tools and finished her block. She was ready to move on so we printed her first. I had brought in my supply of colored and decorative papers, thinking her mermaid print might benefit from such a thing. After looking at my supply, she chose a piece of the green lokta paper for her first proof and some Rives Lightweight White for a second. Below are the two proofs. My earlier advice had been to cut the tail a bit whiter to help balance the brightness of the mermaid's upper body and the large sun on the horizon; she had taken it a step further by widening the ribbons of white at the bottom, another good change. I inked the first proof and demonstrated hand printing, then let her do the second proof from start to finish. Seems like she learned a bit along the way. Meanwhile, Linda had not worked more on her cat piece we proofed last time, but went out and got more wood, and cut two new blocks. Plus she brought in a white enameled butcher tray that she once got to be a palette but she didn't need it for that, and some small size art papers. Since she had watched my printing demonstration earlier, she was confident to do the whole process herself. 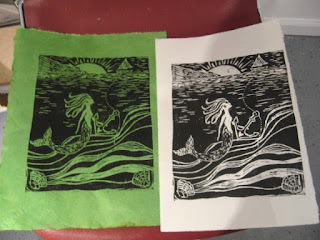 Again we printed both of these with the same oil based black relief ink I had prepared for the mermaid prints, though she had told me from the start that she planned to try hand coloring these. My St Louis catalog reinforced her plan. The first one printed (above) is a white line design, but I believe pink petals and green leaves are part of the plan. The second one (below) is also a plant with flowers, and color is expected there, too, but I don't know the specific plans. 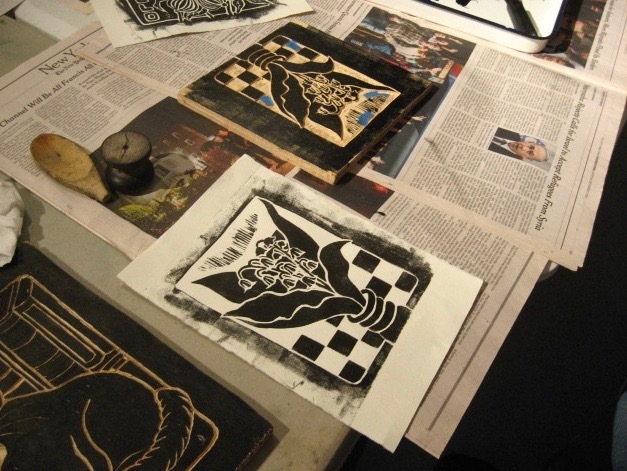 And with that, our 2.5 hours of tonight's class were done, our four woodcut classes are done. Will there be more woodcuts in their future? I don't doubt it. Linda was already talking about buying inks and woods and seemed almost giddy with excitement about future projects. Mary Ellen asked to take home a few bits of colored paper to experiment with in future prints. Both had questions about registration systems. Would either consider retaking this Belmar class? (I was asked by the office to look into it) Depends on timing and availability. I don't see such a thing happening until late summer, but if BelmarArts is willing to put it on the schedule, and actually promotes it this time, it could happen. 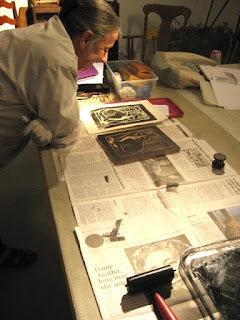 Tonight was the third meeting for the current woodcut class in Belmar. Still only two students showing up out of the three who signed up and paid, but those who are coming have been working hard. Both of my students have been able to make use of my provided tools during class times, but both have been using alternative tools at home in between our meetings. 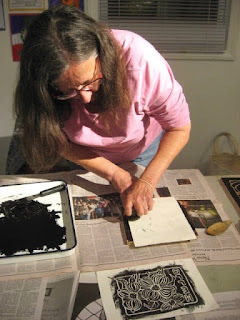 Linda has gotten the furthest into her first block using a variety of x-acto type tools, which I know work because my college students have had to rely on such things over the years. I can't afford to provide imported tools to every student in a college class during class time and I never let people take my tools home to keep working. I still make use of some here and there myself. She came in with a very specific idea she wanted to do, and had a detailed block drawing at the start of our second meeting. Since our last meeting she had used her tools to cut a lot of the image, and even pulled a few pencil rubbings to check the progress of her value balance. What she needed tonight was to get my opinion on a few areas she was unsure of, and use of the better tools to do a few delicate areas. Working efficiently, she felt ready to see how it would print, so I showed her how to pull a proof, using water based ink so it would dry quickly, well before our next class. She was extremely pleased with the result. I'll have a better image of it next time when it's finished and properly inked and printed. First inkings are always low quality, and water based ink is fairly inferior to oil, but this gives her the best take on what she's got so far and what she needs to do before our next meeting to make it better. 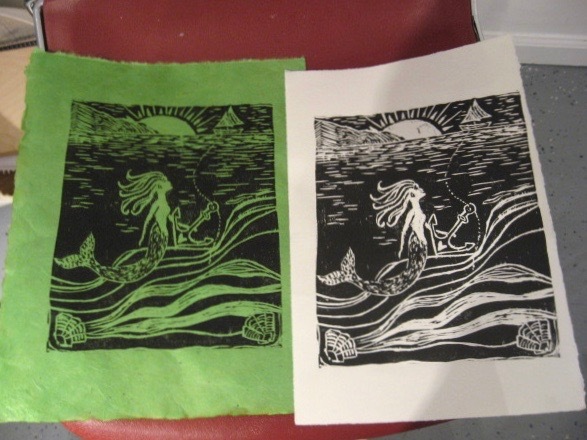 Meanwhile, Mary Ellen came in with a long way to go on her mermaid print. Tried working with a really cheap set of tools, the kind that come in a large package for several dollars, and didn't get too far. The tools I provide the class let her do some better things. Showed her some pages from a Masereel novel that included mermaids and undersea scenes- not to get her to copy, but just for some inspiration. She wasn't going to be printing anything tonight, but she got to watch me demonstrate the process. Maybe she'll be ready to try it next time. We have one more meeting to go, two weeks from tonight. At that point both will be printing something, and maybe even working on ideas for a second piece.